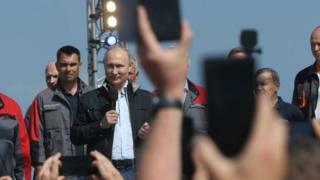 The analysis showed Russia was "pioneering" the use of GPS spoofing techniques to "protect and promote its strategic interests", the report said. C4ADS said there was a "a close correlation between movements of the Russian head of state and GNSS spoofing events". "Whether for profit, protection, or disruption, illicit actors, writ large, stand to gain from the proliferation of these capabilities," it said. John Dunn, writing on the blog of security company Sophos, said the developments logged by C4ADS were "alarming". He added: "The good news is that it's not that hard to detect spoofing with the right technology, nor work out who might be doing it."